1. Verify the customer concern by operating the wiper/washer system. 4. If diagnostic tool still does not communicate with the vehicle, refer to the diagnostic tool manual. NO RESPONSE/NOT EQUIPPED for GEM, go to Pinpoint Test A. 6. If the DTCs retrieved are related to the concern, go to GEM Diagnostic Trouble Code (DTC) Index to continue diagnostics. 7. If no DTCs related to the concern are retrieved, proceed to Symptom Chart to continue diagnostics. CAUTION: Before removing and installing the GEM or its connectors, disconnect the battery. Failure to follow this caution will result in the GEM storing many erroneous DTCs and it may exhibit erratic operation after installation. CAUTION: Be careful when probing the central junction box (CJB), battery junction box (BJB) or any connectors. Damage will result to the connector receptacle if the probe being used is too large. REPAIR the cirucit(s) in question. TEST the system for normal operation. NOTE: If the vehicle is equipped with a manual transmission, depress the clutch while turning the ignition switch to START. Monitor the GEM PIDs IGN_S, IGN_R IGN_A, and IGN_KEY while turning the ignition switch through the START, RUN, OFF and ACC positions. Do the GEM PID values agree with the ignition switch positions? Monitor PID WPMODE, while moving through all wiper control positions on the multifunction switch. Do the GEM PID values agree with switch positions? Trigger the GEM active command WIPER RLY ON and OFF. Do the wipers turn ON and OFF? Trigger the GEM active command WIPER RLY to ON. Trigger the GEM active command SPEED RLY ON and OFF. Does wiper speed change on activation and deactivation of SPEED RLY command? Monitor GEM PID WPPRKSW while turning the wipers ON using the multifunction switch. Do the PID values agree with the wiper position? INSTALL a new multifunction switch; REFER to Section . REPEAT the selftest. Check the multifunction switch. Refer to Wiring Diagrams, Cell 149, Component Testing. Is the multifunction switch OK? REPAIR the circuit(s) in question. REPEAT the selftest. 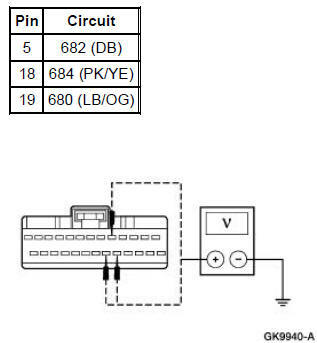 Using the following table, measure the voltage between the GEM C201e Pins, harness side and ground. 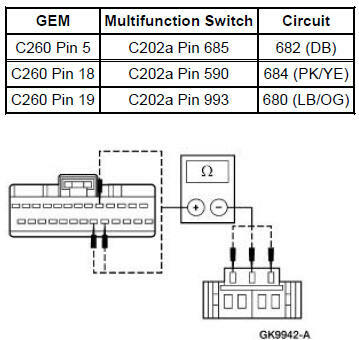 Using the following table, measure the resistance between the GEM C201e Pins, harness side and ground. Are the resistances greater than 10,000 ohms? Using the following table, measure the resistance between the GEM C201e Pins, harness side and multifunction switch C202a Pins, harness side. NOTE: Verify voltage at CJB F26 (30A) before carrying out this test. Connect a fused jumper wire (30A) between wiper ON/OFF relay Pin 3 and Pin 5, harness side. Did the wiper motor activate? Check the wiper ON and OFF relay; refer to Wiring Diagrams, Cell 149, Component Testing. Is the ON/OFF wiper relay OK? REPAIR Circuit 646 (YE/WH). REPEAT the selftest. Measure the voltage between GEM C201d 3 Pin 12, Circuit 646 (YE/WH), harness side and ground. INSTALL a new GEM. For additional information REFER to Section. REPEAT the self-test. CLEAR the DTCs. Measure the resistance between GEM C201d Pin 12, Circuit 646 (YE/WH), harness side and BJB wiper ON/OFF relay Pin 1, Circuit 646 (YE/WH), harness side. Measure the voltages between BJB wiper HIGH/LOW relay Pin 86, Circuit 65 (DG), harness side and ground; and between BJB wiper HIGH/LOW relay Pin 30, Circuit 61 (YE/RD), harness side and ground. Connect a fused jumper wire (30A) between wiper HIGH/LOW relay Pin 30, Circuit 61 (YE/RD), harness side and Pin 87, Circuit 58 (WH), harness side. Did the wiper motor speed increase with the jumper installed and slow down with the jumper removed? INSTALL a new wiper HIGH/LOW relay. REPEAT the self-test. CLEAR the DTCs. Check the wiper HIGH/LOW relay; refer to Wiring Diagrams, Cell 149, Component Testing. Is the wiper HIGH/LOW relay OK? Measure voltage between GEM C201d Pin 5, Circuit 647 (GY/LB), harness side and ground. Measure the resistance between GEM C201d Pin 5, Circuit 647 (GY/LB), harness side and ground. Measure the resistance between GEM C201d Pin 5, Circuit 647 (GY/LB), harness side and wiper HIGH/LOW relay Pin 85, Circuit 647 (GY/LB), harness side. Measure the resistance between wiper HIGH/LOW relay Pin 87A, Circuit 56 (DB/OG), harness side and wiper motor C125 Pin 4, Circuit 56 (DB/OG), harness side. CARRY OUT the windshield wiper motor component test. If the component fails, INSTALL a new wiper motor; REFER to Motor-Windshield Wiper . REPEAT the self-test. INSTALL a new wiper motor; REFER to Motor-Windshield Wiper . REPEAT the self-test. Measure the resistance between wiper motor C125 Pin 1, Circuit 28 (BK/PK), harness side and GEM C201d Pin 1, Circuit 58 (WH), harness side. Monitor GEM PID WPMODE while activating all wiper control positions on the multifunction switch. Does the GEM PID values agree with switch positions? INSTALL a new GEM; REFER to Section . REPEAT the self-test. CLEAR the DTCs. Trigger GEM active command WASH RLY ON and OFF. Do washers turn ON and OFF? Did the washer motor activate? INSTALL a new wiper ON/OFF relay. Check the washer ON/OFF relay; refer to Wiring Diagrams, Cell 149, Component Testing. Is the washer ON/OFF relay OK? REPAIR Circuit 686 (TN/RD). REPEAT the self-test. CLEAR the DTCs. Measure the voltage between GEM C201d Pin 6, Circuit 686 (TN/RD), harness side and ground. 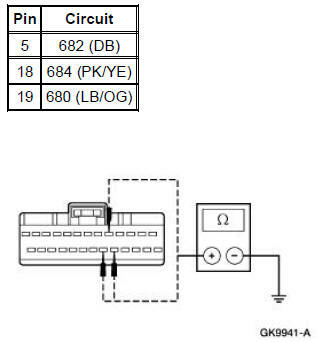 Measure the resistance between GEM C201d Pin 6, Circuit 686 (TN/RD), harness side and ground. Measure the resistance between GEM C201d Pin 6, Circuit 686 (TN/RD), harness side and washer ON/OFF relay Pin 1, Circuit 686 (TN/RD), harness side. REPAIR Circuit 941 (BK/WH). REPEAT the self-test. CLEAR the DTCs. Disconnect: Washer Pump Motor C137. Measure the resistance between washer pump C137 Pin 1, Circuit 941 (BK/WH), harness side and washer pump relay Pin 5, Circuit 941 (BK/WH), harness side. INSTALL a new washer motor. REPAIR Circuit 1205 (BK). REPEAT the self-test. CLEAR the DTCs. Measure the resistance between washer pump C137 Pin 2, Circuit 1205 (BK), harness side and ground. CAUTION: Do not handle the wiper motor abusively when diagnosing the wiper operations. Failure to follow this caution may result in damage to the motor magnets and will make the wiper motor inoperative. Rough handling of new replacement wiper motors may also damage the motor magnets. Use Alternator, Regulator, Battery and Starter Tester (ARBST) to test the wiper motor on the vehicle. To test the wiper motor, disconnect the windshield wiper mounting arm and pivot shaft from the windshield wiper motor; refer to Pivot Arm . Disconnect the wiper motor. Connect the (1) green lead from (2) (ARBST) to the battery negative (-) post. Connect the (3) red lead from ARBST to the wiper motor (4) common brush terminal (terminal 3). Test the low speed mode by connecting a (5) cable from the battery positive (+) post to the (6) low speed brush terminal (terminal 4) and measure the current draw. If the current draw is greater than 3.5 amperes, install a new windshield wiper motor. Test the high speed mode by connecting a cable from the battery positive (+) post to the (7) high speed brush terminal (terminal 5) and measure the current draw. If the current draw is greater than 5.5 amperes, install a new wiper motor.